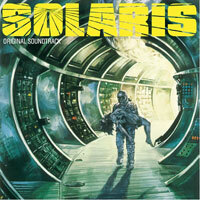 Originally only officially available on an ultra-rare Japanese pressing, Mirumir is incredibly pleased to announce the first official issue of the groundbreaking and mind blowing soundtrack to Tarkovsky's masterpiece, 'Solaris'. Composed by the electronic music pioneer, Eduard Artemyev, 'Solaris' was the first project in what proved to be a fruitful collaboration between director and composer. An absolutely essential piece of electronic music and Russian cinema history, lovingly reissued in a gorgeous package including previously unseen photos from the Tarkovsky archives and a cover pulled from the Italian poster for the film. Remastered from the original film soundtrack and pressed on high quality 180-gram vinyl. Side A in 7 movements, total time 24:50. Side B in 10 movements, total time 26:58.